One year ago today, before my 7th season of Wizards season tickets, I decided to create a Meetup group for Wizards season ticket holders. The plan was to establish a network of season ticket holders who could meet up for food/drinks if we arrived early for games. I figured I'd do it for a few weeks and people wouldn't really be into it. 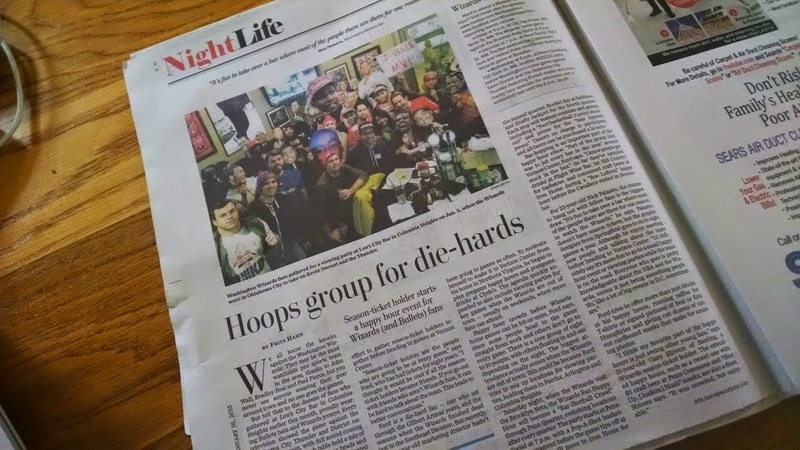 Little did I know we'd have over 400 fans come through, we'd be featured in the printed version of the Washington Post and I'd be on the news! When I first started the group the number of people who joined the group started to grow and our first planned event at RFD was getting a good number of RSVPs. 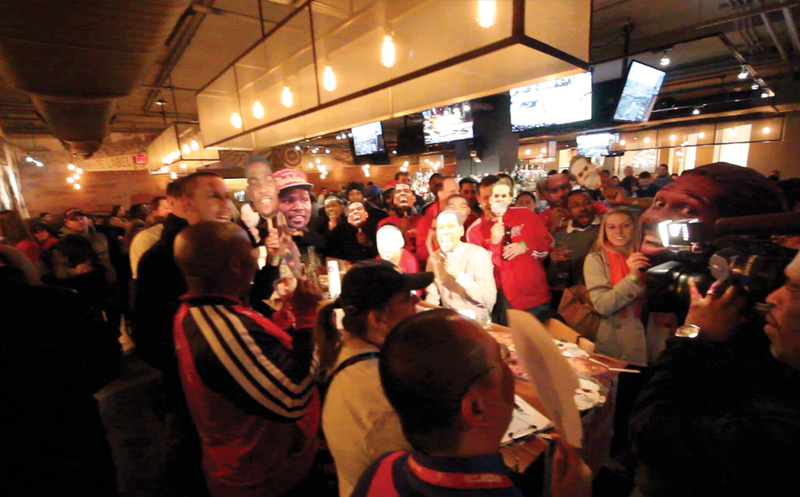 I was sort of surprised but pretty pumped up and we had an amazing turnout of 14 Wizards fans show up. We had so much fun talking basketball and drinking beers and I was excited to do it again. 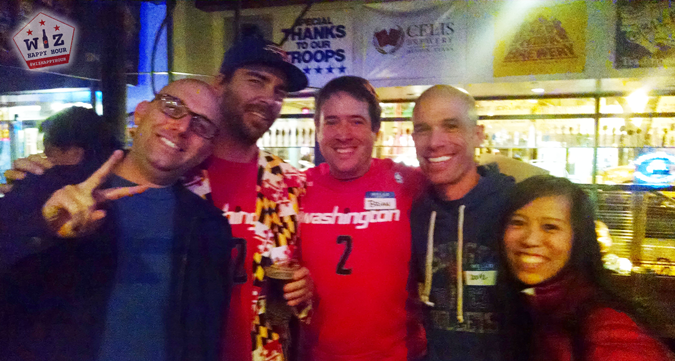 Dan Steinberg of the Washington Post & Other fans at the inaugural Wiz Happy Hour at RFD. A few days later there was another home game, and another planned event. Nobody came! I literally sat at the bar by myself for an hour and a half and none of the 3 people who RSVPd showed up. It was horrible. I thought about quitting at that moment. Just as I was about to leave I ran into one of the Wiz fans who was trying to find me the whole time. Yes! Attendance of 2! Wiz Happy Hour was saved. The rest of the 1st month was pretty rough, but we always had at least 2 other people show up, and it was a lot of fun to meet different fans each week. The "network" of season ticket holders wasn't really working but a social fan network was starting to form. I had a bunch of Wizards autographed prizes that I was giving away to entice people to come and that was a big hit, but it still wasn't really getting people in the door. So around the 6th or so event I decided to add some "wacky bits" to the mix. It was a huge hit. In December with the help from a group member we decided to hold an away game watch event. Up until then it was just pregame happy hours, and fans often couldn't get there early enough or would want to go in the arena early. 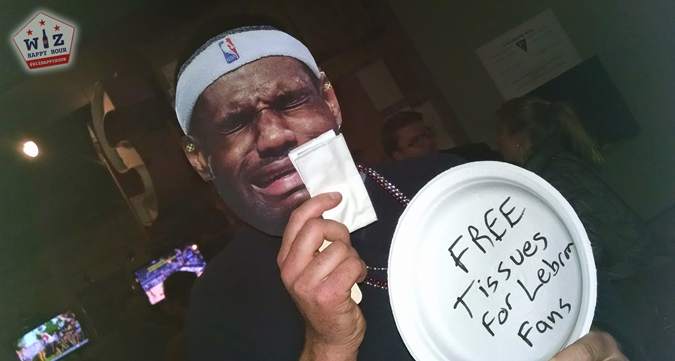 The watch party gave them a chance to enjoy themselves while watching the game on TV at a bar outside of Chinatown. We had 25 awesome fans show up and we realized that this was something that Wizards fans were looking for. By the end of the year we were meeting up for almost every single game, home and away, and we were getting larger groups of fans at each event. We had some really big events and some of the media started to pick up on our group. We were covered by the Washington Post, Fox 5 News, Comcast Sportsnet, multiple shows on 106.7 the Fan and more. Over the course of the season we had a total attendance of 700 fans! 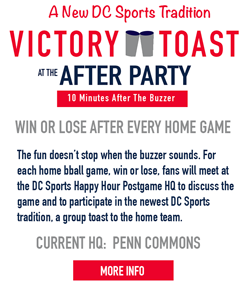 So now I'm excited to ramp up the group for this upcoming Wizards season as a rebranded DC Sports Happy Hour. We have a bunch of "regulars" now and we are excited to meet all the new ones. We want to continue to explore the area's bars & restaurants (last year we hit up 42 different spots!) and spread the Wizards good cheer. This season we'll have more prizes, more wacky bits and we are introducing a new DC tradition. I want to thank everyone who helped turn this group from just a throw away thought in my head to something that people enjoy. I look forward to having you come to one of our events this season! We can't do it without the great Wizards fans out there! Here's to one more year of fun!